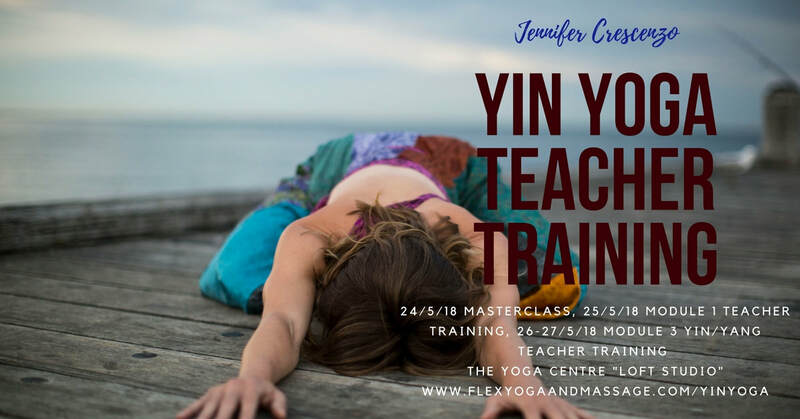 Please register your interest below for 2018 Yin Yoga teacher training dates in Adelaide with Jennifer Crescenzo, 25-27th May. There will be the option to study Module 1 Yin Fundamentals intensive (1 day) or Module 3 Yin/Yang Sequencing training (2 days) separately or together. There's also a Masterclass open for all to attend. Learn more about Jennifer from her website. Yin Yoga is mindful movement. Time is taken as you enter each pose to understand what joints you are working with, how those joints move, and the sensations that might arise as you work through any movement barriers. As you encounter the places in your body where you cannot move or breath with ease, you develop ways to work in those stuck places more patiently and skilfully. As you work through layers of accumulated tension, you may find that your sleep improves, your immune system becomes more robust, and you recover more easily from stress. Yin Yoga postures are held for longer periods of time to give you the opportunity to feel a broader and more subtle range of sensations from stretch and compression in your tissues, to changes in your breath, to the flow of your mental and emotional energy. This regular practice of noticing what arises during and after a posture helps you develop a meditative consciousness that is accessed through your felt sense of your body. In this way your body becomes both the path and the expression of your mediation practice. Ultimately through the postures you develop a clearer sense of self and purpose. You can move more freely, express yourself more skillfully, and communicate your ideas more clearly. In other words Yin Yoga is not just about your movement potential, it’s about your human potential! Note: This intensive can be combined with Yin Yang Sequencing (plus a written assignment) for a 30 Hour Certificate. Course Description: In this one-day course, Jennifer explains the Yin Yoga method and guides you through the basics of cueing Yin postures clearly and effectively. You’ll get a brief overview of the anatomy of Yin and then enter the "Posture Lab” where you’ll experiment with forward folds, backbends, and twists to understand the how’s and why’s of each posture. You’ll observe how different these postures can be for different bodies and learn creative variations and adaptations that make these postures safe and accessible for anyone! This intensive is suitable for teachers who want to learn more about the Yin method or students seeking the tools to practice confidently outside of the studio. The cost includes a manual and a Yoga Alliance recognized Certificate of Completion. What do joints need to be healthy? What is range of motion (ROM) and how much do you need? What role does the nervous system play in regulating ROM? What is the science of stretching? How do I apply the concepts of Yin and Yang to yoga postures? What are the basic Yin postures? What does it mean to set up a posture in a Yin way? What does a target area approach to posture mean? How do I cue someone effectively into and out of a pose using the target area approach? How do I offer props and variations to help a student explore her potential in the pose? How does tuning into bodily sensation become a pathway to meditation? The Yoga Centre, Gilbert Street, Adelaide. This intensive is open to students with a keen interest in deepening their Yin yoga practice, or for certified yoga teachers to learn to teach Yin yoga. Yang movements test you, insisting that you reach beyond what you think is possible. Yin movements unfold without effort or strain, allowing things to be as they are. In this training, you will learn to lead classes that balance the heating qualities of Yang practice with the cooling qualities of Yin practice. In led Yin Yang sequences you will glide like a serpent, crouch like a tiger, and strike like a ninja! Through movement you will learn more about your joints and how to use Yin and Yang approaches to cultivate strength, balance, coordination, and fluidity. Expect a led Yin Yang practice, lecture and discussion to cover key concepts, and movement play so that you can integrate these concepts through your own direct, embodied experience. How do I distinguish passive and active ranges of motion(ROM)? What is the value of isolating movement? What is graded exposure to movement? Why do some movements feel safe? Is pain an objective measure of threat or injury? How do I apply Yin and Yang principles to working with joints in isolation? How do I close the gap between passive and active ranges of motion? How do I progress a range of motion skilfully? How can I use props to provide feedback and improve coordination and control? How does play help overcome fear of certain movements or ranges of motion? How do I introduce movement play skillfully within a sequence? How does movement play become a path to meditative awareness? 10am-6pm Saturday 26/5 to Sunday 27/5/18. This intensive is open to students with a keen interest in deepening their Yin yoga practice, or for certified yoga teachers to learn to teach Yin/Yang yoga. Previous Yin yoga teacher training certification is not compulsory but recommended. In this masterclass you will move through reclined, seated, and standing postures that evoke the energy of the Yin Tiger and the Yang Dragon. The Tiger moves low and slow on the earth, with great precision and attention. She is patient and bides her time. When she strikes, she is quick and powerful! Tiger sequences will focus on coordination and include crawling, lunging, and squatting. As you direct energy more efficiently, your transitions between postures are more effortless. The Dragon lies coiled and still in a deep pool of water, until she is awakened and her energy spirals upward to bring the rain that nourishes all life. The Dragon flows like water, gradually building energy like a trickle of water becomes a waterfall. Dragon sequences will focus on flow and include rolling, circling, and sliding. As you transition from movement to movement, you will feel the ripples in your hips and spine and the flow of Qi in your whole body. BONUS: Complimentary class for Yin/Yang at the Yoga Centre, Tuesday or Friday mornings with Ainhoa. On completion of Module ONE and/or Module TWO or THREE training, you will receive a certificate acknowledging completion. Module ONE and Module THREE plus written assignment can be combined for a 30 hour certificate. These hours can be used as Continuing Education credits. Jennifer Crescenzo is an RYT 500 through Yoga Alliance which credentials her to facilitate teacher training. Jennifer has been teaching yoga in the U.S. and Australia for 14 years. She is a Yoga Alliance E-RYT 500 and Certified Continuing Education Provider (YACEP) She has created and facilitated hundreds of hours of teacher training including YA certified 200 Hour Teacher Trainings, Yin Teacher Trainings, and Anatomy for Yoga Teachers. Jennifer began her Yin Yoga studies with Paul Grilley in 2009 and continues under his mentorship, including advanced studies in the Bhagavad Gita and Patanjali. She has additional Yin training with Sarah Powers. Seeking greater understanding of the human form, Jennifer studies with leading fascia researcher and educator Tom Myers and dissected a human cadaver under the instruction of Gil Hedley. Her curiosity about movement and its transformative potential is boundless and she has trained in Tae Kwon Do, Kung Fu, belly dance, and Olympic Lifting (to name a few). Recently she has been crawling and climbing with the primal movers at MovNat, investigating the relationship between complex movement and brain function with Fighting Monkey, and exploring Functional Range Conditioning with GraceinMovmnt. Jennifer uses movement as a means to question everything she believes and she trusts that the uncomfortable “friction” of learning something new sparks creative insights. Her trainings will help you explore your movement potential to realize your human potential. 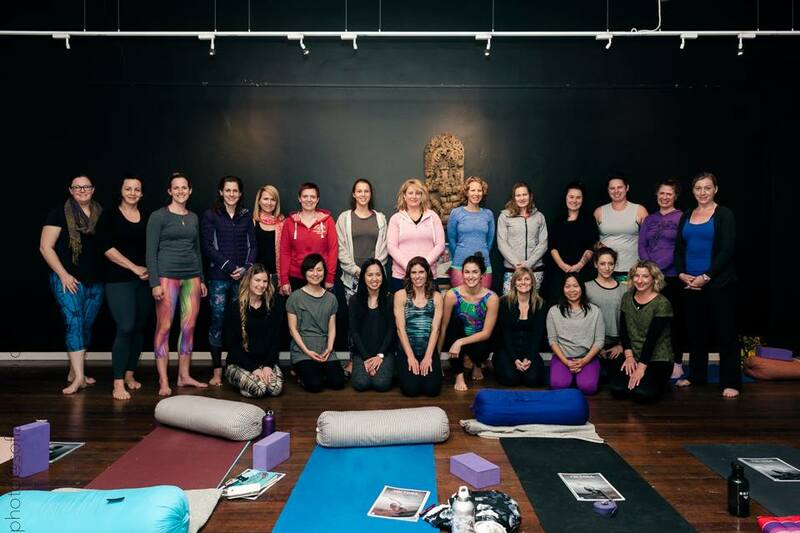 Sign up to the Yin Yoga Adelaide mailing list to be kept informed of dates and information for this amazing workshop and masterclass series, to be held in May 2018. How many students will be in the course? There will be a maximum of 25 places for each course. Please bring your own yoga mat if you have one (mat hire is available at each venue for $2 per mat). Bolsters, blankets and straps are the venue but you are welcome to bring your own. Bring a pen to take notes and a water bottle. Will this course count towards a yoga teacher training certificate? This course is designed as an add-on training to already qualified yoga teachers. A certificate is provided once the training has been successfully completed which can be used as recognized continuing education credits. Can I participate in the yoga teacher training weekend workshops if I am not a qualified yoga teacher? This course is designed for yoga teachers with a 200 hour course background. Dedicated yoga students, particularly experienced Yin yoga students wishing to deepen their practice are also welcome to participate. Do I have to participate in both modules? You will receive a certificate for each individual level you successfully complete, and you may participate in each Module as a stand alone course. Module 3 Yin/Yang Sequencing is a 18 hour certificate (15 hours contact, 3 hours non contact), the Module 1 Fundamentals intensive is a 10 hour certificate (8 contact, 2 non contact). A 30 hour Yin Yoga teaching certificate will be awarded if both modules + non contact reading time + written assignment is successfully completed. Non-contact hours includes reading and watching content provided by Jennifer on this link. Should I participate in the Masterclasses if I am already doing the training course? The masterclasses will be an opportunity to experience the sequencing and flow of a full class. The teacher training course is held in a "posture lab" style - breaking down the postures, considering variations and modifications, and discussing the target area, dimensions of sensation, and other relevant aspects of the postures. Am I able to participate in the Yin/Yang Module if I have not completed Module I? Yes, however it is strongly recommended but not essential to have some background in practicing Yin yoga. Is the course refundable after booking? The masterclasses are not refundable but are transferable to another guest if you can no longer attend. The teacher training course is refundable up until the early bird cut-off date, a $50 cancellation charge will apply (or you may transfer the course to another student). What if I prefer not to pay online? Payment is via the online booking link via credit card or bank transfer. If you wish to pay by cash, please contact Deanne directly - please note your place is not reserved until full payment has been made.